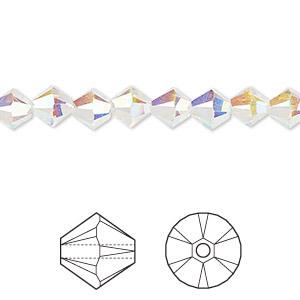 Bead, Swarovski® crystals, crystal AB2X, 6mm Xilion bicone (5328). Sold per pkg of 24. Item Number: H20-6018CY Have a question about this item? Stunning Swarovski crystals have twice the sparkle and shine with the double AB finish. Versatile bicones in popular 6mm size. Swarovski crystal components are made in Austria and are considered the finest products of their kind in the world. Bead, Swarovski® crystals, crystal AB2X, 6mm Xilion bicone (5328). Sold per pkg of 360. Bead, Swarovski® crystals, crystal AB2X, 6mm Xilion bicone (5328). Sold per pkg of 144 (1 gross).